I think what I love most about medieval cooking is looking at the different versions there are under the same nominal title. Forme of Curye is the 14th Century English manuscript and it has a couple of different versions as a result of being manually rewritten out and copied. That puts some slight variation differences depending on which text you happen to look at. This recipes, Chyches or Chiches, has what seems like a minor issue but does create a difference in redacting it. And that is the placement of a comma or lackthereof between two words. Chyches. _Vicia_, vetches. In Fr. _Chiches_. Wry hem. _Dry hem_, or _cover hem_. Chaucer, v. wrey. Aymers. Embers; of which it is evidently a corruption. In this text version and in this copy of the manuscript http://www.pbm.com/~lindahl/foc/FoC081small.html the comma in garlic hole safroun is between garlic and hole (garlic, hole saffron) indicating that it is the saffron which is whole, and the garlic may or may not be. The version that Hiatt and Butler edited, which is the version that is most used in other redactions on the web has the comma between hole and saffron – making it garlic hole, saffron. (the note on chyches says that Il Libro della Cucina (14th cenury Italian) has a similiar version. Thanks to the wonderful powers of wayback, I’ve been able to find an english online translation of that text. Oh internet. What did we do without you? Not look at An original copy of the manuscript which has no comma between hole and safroun – but no clear comma between garlic and hole either, that’s for sure. I think that’s just fascinating. How many recipes have been changed across the ages as a result of someone not copying 100% was written before them? Take chickpeas and dry them in ashes all night, or lay them in hot embers, in the morning, wash them in clean water and do them over the fire with clean water. Boil them up and then add oil, garlic, whole saffron, strong spices and salt, boil it and serve it forth. 1/4 teaspoon each of clove, ginger, cinnamon, pepper, salt. 500g of dried chickpeas. (soaked overnight, with water replaced after six hours), then simmered for 45 minutes to soften. For both methods the actual cooking was the same. Roast the chickpeas at 160 degrees for 45 minutes. 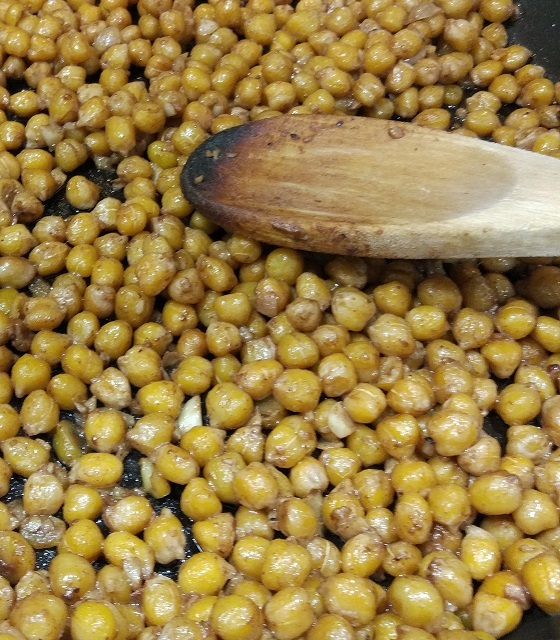 Both dried and canned chickpeas smelt nutty and were a golden colour when done. Add the garlic into a hot pan of shallow oil and allow to soften. Add the chickpeas, add the spices and saffron, add enough water to cover and cook until the water is gone. Both came out, “okay” for different reasons. In method 1, I just wasn’t getting any garlic taste through. I really liked the texture of the dish and the spice level was fine, (the saffron flavour came through beautifully and really lifted it) but there was no garlic flavour at all -I may as well have not added it. In method 2, the flavour was good -less of a saffron taste initally (although the saffron did linger so I was able to taste it a minute after trying the dish) but the texture. Ayyeee. I think maybe I didn’t simmer the chickpeas long enough? They had a harder texture compared to the canned chickpeas which I was not a fan of. I still like the taste and the idea behind Spiced Chickpeas so I’m still going to add this to the menu, but using canned chickpeas and minced garlic I think.